Firstly I just wanted to apologise for the state of my nails, I'm aware they are splitting and the shape of them isn't amazing. As well as my fingers look like sausages. I finally need to buy nails colour wheel, to swatch nail polishes for you. This is the most expensive nail polish in my collection. I still bought it with discount, I paid £13 instead of £17.50. My first (last?) Chanel nail polish and I must say it's pretty good, but I think that cheaper nail polishes can also be very good. 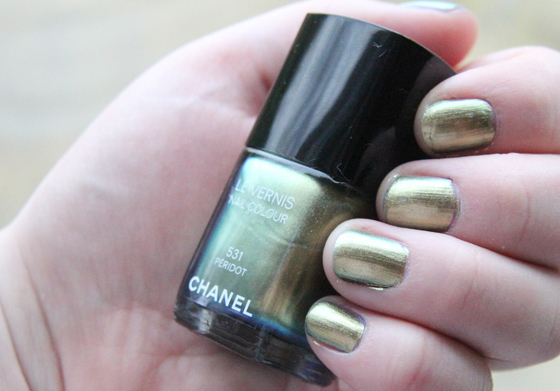 This may be one of most popular nail polish from Chanel. What I mostly like about is that in different light the colour changes, from gold, blue to green (but I just don't like the colour on my nails). I love the bottle! You can wear one coat of it, but I normally always apply two coats. I didn't apply top coat. This nail polish can last for around 2-3 days without chipping. If you really want it, but don't want to spend so much money, you can always get a dupe. Have a look at Fleur's dupe post. Overall the nail polish is good, but it's not worth spending so much money! There is just too much hype around it. I might sell mine soon as I don't really like the colour on my nails. If anyone is interested in buying it let me know. Love the colour! It's so unique! But the price can be really off putting though! I've been looking for a colour like this! All the golds I've found are too yellowy but this is lush!